The best way to have to deal with something in your life is to tell people who love you, I mean really love you what that secret something you're dealing with might be. If you blog about being afraid to trust God and if you tell your pastor you're in a bit of a snit over the circumstances in your life, you can pretty much be guaranteed that you will have to face things that you would rather not and do it a whole lot sooner than you figured you were going to have to anyway. Confession is a catalyst for stuff to happen, good stuff and the not so good stuff. One of the first thing that happened was my heat went out. Did I face that problem by remembering God's goodness and provision? Sigh. No. I added it to the lengthening list of things that I am unhappy about. Neck injury, poor health, no job, no money being paid by the disability insurance, car needs maintenance, can't afford Christmas and now with the temperature is dropping my central heat is making sounds that resemble a dentist's drill. It happened to go out on a Sunday morning at about 5:00. There was nothing I knew how to do so I turned the system off and went to church. I have never been a homeowner before and while it has its perks it also has its problems. When something breaks you cannot pick up the phone and call the landlord. You have to deal with it. When the heat goes out and it's 15 degrees out, you cannot ignore it. I had to ask some folks at church what one does on a Sunday with such a problem. I not only got some sage advice but I got my heat fixed for free because the people I fellowship with put their faith into action. You would think I would remember all the times that God has provided for me even while I was being petulant and my faith was puny. I have had a very strange and amazing life and at each turn of the road my God has taken care of me. His timing is perfect and his resources are infinite. So why must I always have a mid-strife crisis of faith? Because I focus on the bad stuff that happens to the exclusion of the good? Probably. So let me focus on another good that has happened to me. I have been trying to be brave about the holiday season. I miss my kids, I miss the old family traditions (the good ones) and I wish I could see my grandson. I have been trying to be positive and I was losing the fight. It is so much easier to feel sorry for yourself than to count your blessings and be grateful. Ever notice that? A couple of days ago I was in the chat channel that belongs to my friend, teacher and the meanest Calvinist on the planet, James White. I have known James for over a decade now and he's seen me at my best and worst. When I was a 'Reluctant Calvinist' James was a willing and patient teacher. Over the years he has taught me, laughed with and at me, commiserated with me when my life was crazy and encouraged me to fight the good fight. 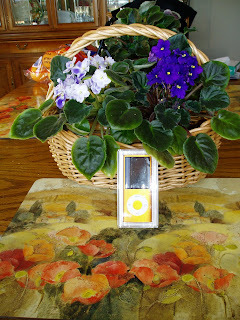 On this particular day he was shopping for an iPod and getting totally geeked out like most technically savvy gadget gurus do and I mentioned I did not have an iPod. As you can see from the picture, I have one now. Of course I have no idea in the world how to use it, but the man who is so busy running an apologetics ministry; learning Arabic; writing books; making videos; debating scholars and teaching has promised to teach me how to use it. Like he doesn't have enough to do.